Phosphosiderite has a lovely calming, soothing vibration that aids stress, but that is not all there is to it, as it is a healing stone that will resonate within all of the chakras. Once you begin to use it more, particularly in meditation, you will find it has some quite interesting properties including having a powerful action to aid spirituality. 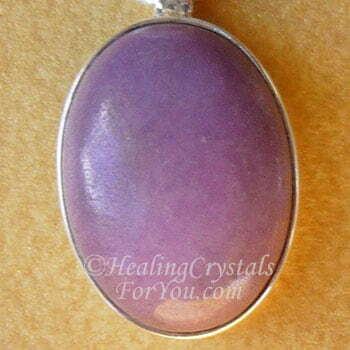 It is said to be a rare stone, but anyone who really wants to get some, will find it fairly easy to acquire. I found my first piece by accident, or maybe it found me, and its energy was quite obvious when I touched it. 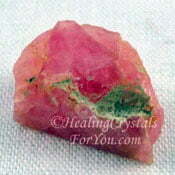 I have since bought more as this stone, as it has excellent metaphysical qualities. 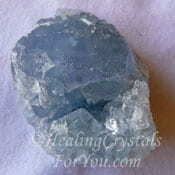 At first touch you will discover that this is a crystal with a strong heart based energy, that seems to draw you to it. Most of the crystals that are available for sale are said to come from Chile, Argentina, Germany, Portugal or the USA, but I have read that it is also found in a number of other European countries. The meaning of this stones name is related to its mineral makeup, as it contains both phosphorous, phospho, and iron, siderite. The second part of the word, siderite, relates to the Greek word sideros, meaning iron. 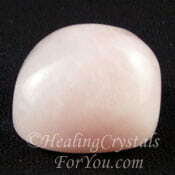 It is said to be also known as 'piedrea voga' meaning pink stone, and 'la rosa voca' meaning pink rock. 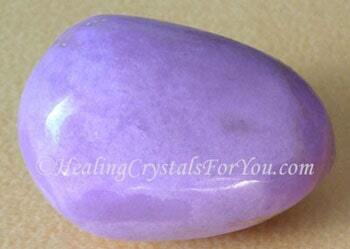 Although all of the stone I have is this pretty pink or light orchid purple color, it also comes in other colors. 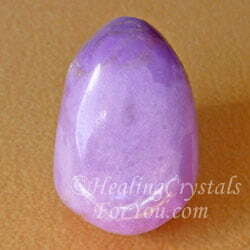 In regard to the lavender pink stone, its color varies from a very light pink through to a deep lilac color, even within the same stone. 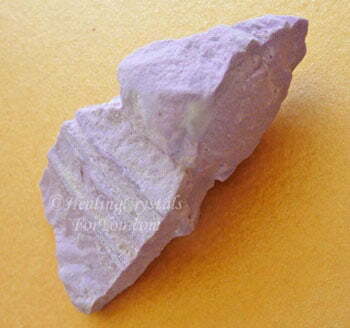 The lavender pink in the stone is not a matte color, but is made up more than one shade of pink, within the same stone. 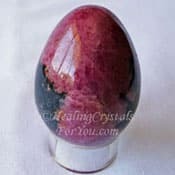 I have read that this stone also comes in other colors and it is said that it is found as deep purple, rose red, reddish brown, green and some very rare clear stones. There is some speculation that it is a variety of Variscite, but as yet this information has not been substantiated. You will also notice yellow veins within the stone. These may be very fine lines or heavier lines, and some stones even have yellow patches in them. Not all stones have obvious gold colored markings, with many having fine almost imperceptible yellow lines. I am not a mineralogist but it is being said that the yellow inclusion is Cacoxenite. 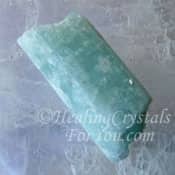 This crystal is powerful to assist you to feel calm, and its action at the heart chakra and higher heart is quite obvious. You can feel it by simply picking up a piece of this stone, and is vibration is helpful to use as one of the ways to relieve stress. I bought my first piece of this crystal on impulse, coincidence or synchronicity in action, and had no idea what its metaphysical properties or healing attributes were, but simply felt an immediate connection with its energy. Once I had cleansed it, I felt drawn to keep my Phosphosiderite on my body continuously, and also put it under my pillow at night. As there was very little information available on its attributes, using it in meditation seemed like a good way to discover more information about its properties, while I researched more about the make-up of the stone. Phosphosiderite is easy to buy. During my first meditation with this crystal, its resonance was mostly centered in the area of the heart and higher heart or thymus chakra. This stones energy also made a strong connection with my third eye, and I felt a strong action in the brow or soma chakra as well. 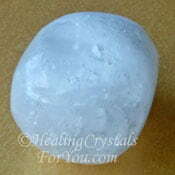 The second time I used it, my intuition led me to try it at the base or root chakra first. Its energy was easy to feel as it was working, and I could feel the energy spreading out and impacting the whole of my lower stomach. After a few minutes I moved it to the navel and again you could clearly feel its energy flowing out into the organs nearby. At the solar plexus or power chakra I was surprised at the surge of energy there, that immediately made a strong connection with my third eye and brow chakra. I could see and feel the energy filling my head, accompanied by a truly beautiful golden light. Its energy is quite obvious and it helps you to make a deep spiritual connection. 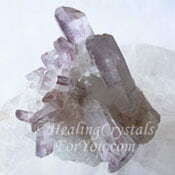 They are excellent healing crystals for you to use in your daily meditation as they connect strongly to both the third eye and brow chakra, which is also known as the soma chakra. 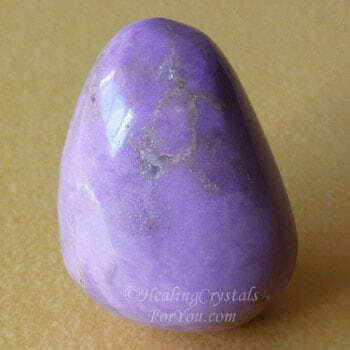 The best way to use this stone is definitely in meditation, and I have found that this is a powerful stone to use for this purpose. If you are not very familiar with how to meditate, take a look at my article which gives you straightforward instructions about easy methods of meditation. Perhaps the reason why it has such a strong resonance could be the inclusion of Cacoxenite. This would make it a powerful asset for making contact with the higher realms. Using Phosphosiderite in meditation was very interesting, because I found that each time I used it I got different results. 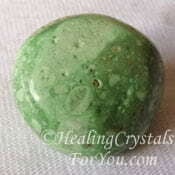 With every use of this stone when placed above the heart chakra, it makes a better connection to the higher chakras. From what I have read it seems that the soma or brow chakra is associated with helping you to connect to reality in a different way, both physically and spiritually. By helping you to properly connect to the physical world, but without ignoring the strong connection you have to spirit, stones that aid this area are powerful to ensure your connection with spirit is possible. 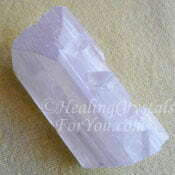 When you use this crystal what you feel happening with each use of this crystal is an expansion of its action. The action could be linked to the presence of Cacoxenite in the stones, which is known to cause an expansion of your consciousness. With each use of this crystal, it feels like it is actively healing your physical body, more deeply and strongly with each use. At the same time it is working on raising your vibration, to aid emotional and spiritual healing, and assisting your spiritual awakening. 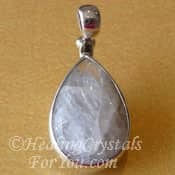 It is an excellent stone for connecting with your spirit guide, as it opens up a stronger spiritual connection. I found my head was filled with an amazing large blue circle of light, which was surrounded by bright white light and around that the purest golden light. For a truly beautiful spiritual connection, you may like to use it at the throat chakra. When placed there it immediately connects you upwards, through all of the higher chakras. It is almost like it has an agenda, and will work on the areas where it is most needed first and then go on to other areas. I found it will also stimulate clairaudience, as it often brings through clear clairaudient communication when I am meditating with it. It opens the crown chakra and you may feel the energy moving upwards, via the soul star chakra, and making a connection to your higher self and the higher spiritual realms. It was truly spiritual and I could see the presence of beings hovering, and bringing through healing on many levels, including deep spiritual healing. I could feel their communication to me as a loving embrace of energy, as well as hearing clairaudiently the message they had for me. 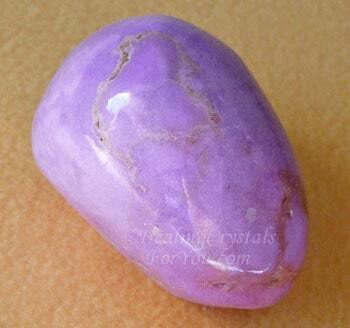 I came out of the meditation knowing that I wanted to wear this stone every day. This led to me ordering jewelry made from this stone. 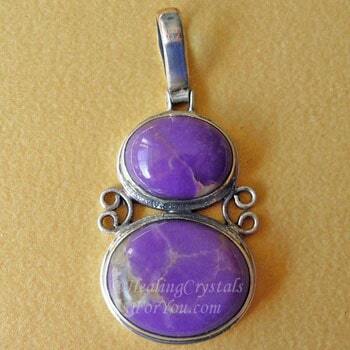 This stone is fairly easy to obtain made into various types of jewelry including rings and pendants. Keeping it on your body is highly beneficial as it makes it easier for you to keep this energy within your auric field. Although a piece of stone can be used to keep on your body, you can use any type of Phosphosiderite crystal jewelry as well as pieces of the stone for this purpose. Pendants, rings and earrings are now becoming more easily available, and these are all excellent ways to keep this stone on your body. Phosphosiderite earrings, like the ones that are illustrated here on the left, seem fairly easy to find. 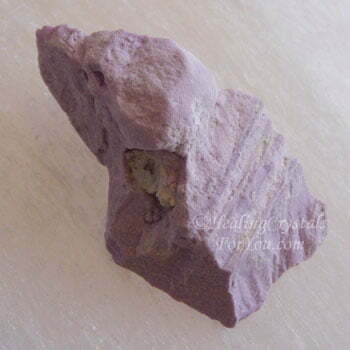 You can also get beads made from this stone, and they come in the plain lavender orchid color, as well as beads that have the orchid pink color with mustard yellow inclusions running through the stone. If you are into doing beading, this stone is not just beautiful, but this is a way that this stone could easily be used with other stones that combine well with it. Wearing it is a good way to aid healing of any issue you have, and it may benefit you physically as well as boosting spiritual healing as well. 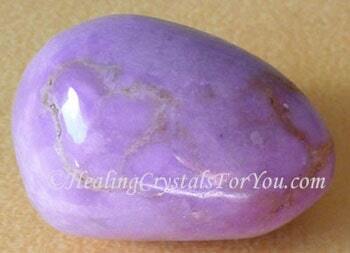 Any color of these stones are useful to wear for a number of reasons, including helping to bring healing to the body. As they also bring through spiritual experiences, including the potential to raise your vibration, I feel that wearing it is an excellent choice for anyone who is working on your spirituality. What I really like about this stone is that its not just a spiritual stone, but it also has an excellent healing action in the body. If you have trouble sleeping it has a lovely calming action if you place it under your pillow at night. Its action can easily be felt in the stomach area, and it seems to work to support the thyroid and adrenal glands. 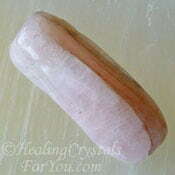 It may assist the healing of other areas depending on your need. 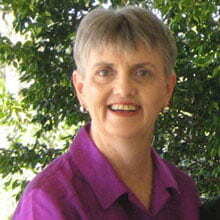 If you have health issues related to aging, if used regularly it may help to negate these problems. Keeping it on your body may allow it to help your cells to be reprogrammed, and for your cells to be regenerated. 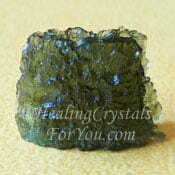 It may also aid the healing of issues that may be partly or fully psychosomatic in nature. Its strong action at the heart chakra make me aware of its action there. If you have heart related health concerns, it may be of benefit to use it there to see if it will assist your healing. It may also help issues within the lungs, such as respiratory problems like colds or flu. 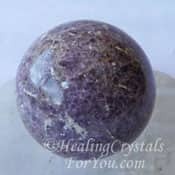 If you use your Phosphosiderite within the power chakra, which is another name for the solar plexus chakra, it may help you to break emotional ties that bind you to others. This may specifically be those that are not be in your best interests. Along with this can go emotional healing that will help you to align yourself more fully with the Divine and the desires of your higher self that may have been decided before you incarnated. Its action may aid your ego to let go of selfish needs. If used by both parties in a significant relationship, it may help to bring you closer and align your life together, with Divine will. While this crystal may not be a common stone, it is worth seeing if you can get a piece, as it is a stone that is beneficial to use. It may be especially helpful if you have been doing spiritual work and would like to open yourself up to greater growth. "Thousands of candles can be lit from a single candle, and the life of the candle will not be shortened. Happiness never decreases by being shared." Buddha. To boost its action to aid you to relieve stress, combine it with some of the other crystals from the list in my article on methods to relieve stress. 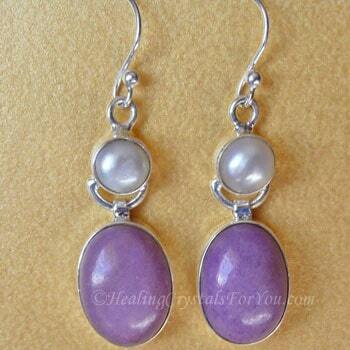 In particular use it with Lilac Lepidolite, Pink Kunzite, Amblygonite or Aquamarine Crystals. If you have both on you during meditation, it helps you to make a better connection to the higher realms. 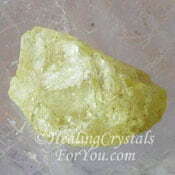 You may also like to use it with Cacoxenite in quartz, to boost the amount of Cacoxenite. This will be a powerful combination to help you to eliminate psychic cords or negative attachments, that may have stopped you from moving on with your life. 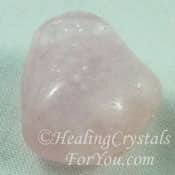 If you wish to create a better heart or higher heart or thymus chakra connection when you are using Phosphosiderite, this vibration may be strengthened by combining it with other heart based stones. Crystals such as Tugtupite, Pink Danburite, Lithium Quartz, Rhodonite, Petalite, Kunzite, Morganite or Rose Quartz Crystal, Variscite combine well with it. Phosphosiderite is a crystal that connects very strongly with high crystal energy stones, even though it may not be as high vibration as those you use it with. 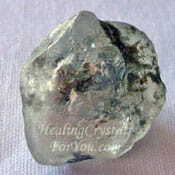 If you want to use this crystal for spiritual work, combine it with high vibration stones that will aid your connection to the higher realms. I have particularly noticed that it seems to come alive when you also have the green tektite Moldavite on your body, and vibrates very strongly, making a very powerful connection. 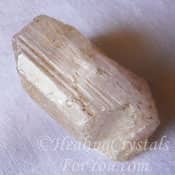 To create a strong action to aid astral travel, use this crystal with any of the above high vibration crystals, as well as with Brookite. 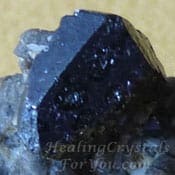 Brookite has a strong action to expand this pink stones action, and help to bring a stronger contact with your spirit guides and other beings in the higher realms. High vibration crystals such as Selenite, Danburite, the lovely White Scolecite crystals, Lavender Yttrium Fluorite, Herderite, Phenacite, Blue Celestite, Natrolite or Moldavite are all powerful used in combination with this crystal. If you find when you first start using it that it makes you feel, a sign of possibly being ungrounded, combine it for a while with good spiritual grounding stones. It should pass quite quickly as it only has this effect until you adapt to it, as once you have assimilated its energy it seems fine.